Omega 3 benefit - It is amazing! The human brain needs large amount of DHA. A normal adult human brain contains more than 20 grams of DHA. Low DHA levels may cause low brain serotonin levels which are connected to an increased tendency to depression, suicide, and violence. A high intake of omega 3 oil is linked to a significant decrease in age-related memory loss and lower risk of developing Alzheimer's disease. Studies found that Alzheimer's patients given an omega-3-rich supplement showed a significant improvement in their quality of life. There is a clear association between low levels of essential nutrients omega-3 fatty acids and depression as concluded in several studies. Other studies have shown that countries with a high level of fish consumption have fewer cases of depression. Researchers at Harvard Medical School have treated bipolar disorder (manic-depressive illness) successfully using fish oil supplementation. British researchers reported encouraging results in the treatment of schizophrenia. An adequate intake of DHA and EPA is very crucial during pregnancy and lactation. The mother’s body needs to supply DHA and EPA yet is unable to synthesize these essential fatty acids itself. DHA makes up 15 to 20% of the cerebral cortex and 30 to 60% of the retina. It is important and necessary for normal development of the fetus and baby. Some studies has concluded that insufficient intake of omega-3 fatty acids may increase the risk of premature birth and an abnormally low birth weight. Pregnant mother tends to drain her DHA reserves. It can easily lead to a deficiency and some researchers believe that preeclampsia (pregnancy-related high blood pressure) and postpartum depression could be linked to a DHA deficiency. Experts recommend pregnancy and lactation women get at least 500-600 mg of DHA every day. She can either eats a few serving of fatty fish a week or overcome by taking a good fish oil supplement daily. Emerging evidence also show that low levels of omega-3 acids are associated with hyperactivity in children. Researchers at the University of Sydney discovered that children who regularly eat fresh, oily fish have a four times lower risk of developing asthma than do children who rarely eat such fish. They found the link that the EPA present in the fish may prevent the development of asthma or reduce its severity by reducing airway inflammation and responsiveness. Researchers at the University of Wyoming also discovered that giving 3.3 grams/day of fish oil to asthma patients has markedly reduces breathing difficulties and other symptoms. Other researches have also found fish oil to be essential in the treatment of other lung diseases such as cystic fibrosis and emphysema. An large amount of medical reports showed that omega 3 fish oils prevent and may help to ameliorate or reverse atherosclerosis, angina, heart attack, congestive heart failure, arrhythmias, stroke, and peripheral vascular disease. Essential nutrients omega 3 help maintain the elasticity of artery walls, prevent blood clotting, reduce blood pressure and stabilize heart rhythm. Danish researchers have found that eating fish oil supplements may help prevent arrhythmias and sudden cardiac failure and death in healthy men. A study in Italy of 11,000 heart attack survivors found that patients eating with fish oils supplements markedly reduced their risk of another heart attack, a stroke or death. A group of German researchers concluded that eating omega 3 fish oil vitamin supplements for 2 years caused regression of atherosclerotic deposits. American medical researchers report that men who consume fish once or more every week have a 50% lower risk of dying from a sudden cardiac event than do men who eat fish less than once a month. Greek researchers report that men suffering from angina and eat essential nutrients omega fish oil supplements (10 grams/day) showed reduce of the number of attacks by 41%. Norwegian medical doctors have discovered that omega 3 fish oil supplementation reduces the severity of a heart attack. Indian researchers report that patients started eating omega 3 supplements immediately after a heart attack reduces future complications. Clinical trials have shown that omega 3 oils are safe for heart disease patients. Fish oils also benefit bypass surgery and angioplasty patients. Researchers suggest that an adequate daily intake (about 1 gram) of EPA and DHA is essential to maintain a healthy heart. Researchers at the University of Cincinnati have found that eating as little as 2 grams/day of fish oil (410 mg of EPA plus 285 mg of DHA) supplements can lower diastolic pressure by 4.4 mm Hg and systolic pressure by 6.5 mm Hg in people with elevated blood pressure. Enough to avoid taking drugs in cases of borderline hypertension. Several other clinical trials have concluded that Omega 3 fish oils are indeed effective in lowering high blood pressure and that they may work even better if combined with a program of salt restriction. Omega 3 oils are effective in reducing inflammation and can be of great help to people suffering from rheumatoid arthritis or ulcerative colitis. Eating as little as 2.7 grams of EPA and 1.8 grams of DHA supplements a day can reduce the number of tender joints and increase the time before fatigue sets in. Some studies have showed a decrease in morning stiffness. Patients with ulcerative colitis have abnormally low blood levels of EPA. Clinical trials have shown that supplementation with fish oil (2.7 grams of EPA and 1.8 grams of DHA daily) can reduce the severity of the condition by more than 50% and many patients stop using anti-inflammatory medication and steroids. Many evidences have shown that omega fish oil consumption can delay or reduce tumor development in breast cancer. Studies have also concluded that a high blood level of omega-3 fatty acids combined with a low level of omega-6 acids reduces the risk of developing breast cancer. Eat as little as 2.5 grams of fish oils supplements has been found effective in preventing the progression from benign polyps to colon cancer. Korean researchers discovered prostate cancer patients have low blood levels of omega-3 fatty acids. Greek researchers report that eating fish oil supplements improves survival and quality of life in terminally ill cancer patients. One of the best quality Omega 3 supplement sources are from Salmon from the unpolluted Southern Oceans near New Zealand. We recommend Xtend-Life Natural Vitamin. 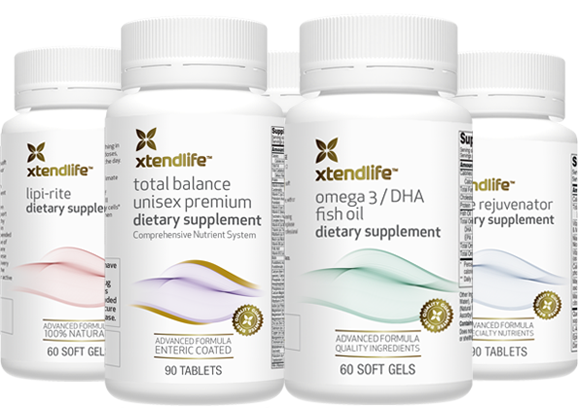 You can read our review on Xtend-Life Natural Vitamin. Back from here to Nutrition Guide page. Read more about nutritional supplement guide; how to buy dietary supplement. Read more about omega 3 benefit.